There’s an extremely thin line between being brave and stupid – and this guy rides that line often. For his latest stunt, serial daredevil 8Booth jumped off a building, dropping down 129 feet before falling into the harbor below. 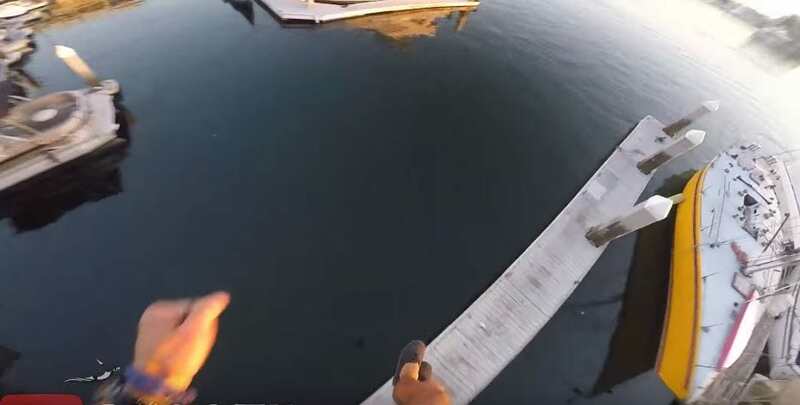 As if the video wasn’t terrifying enough, he almost missed the water. According to Thrillist, the building he jumped off was an eight-story apartment complex that looks over Newport Harbor in Newport Beach, California. But 8Booth, who calls himself ‘a professional,’ isn’t a stranger to death-defying stunts. Back in September, he jumped four stories into a swimming pool in Laguna Beach. He’s also jumped off cliffs at California’s Crystal Cove, where he just barely missed hitting the rocks. In addition to jumping off several rock faces and roofs, his YouTube channel also shows he’s partial to a deadly free dive every now and then. It’s no wonder why the police aren’t particularly fond of this antic.